Welcome to the Department for Visceral, Thoracic and Vascular Surgery at the University Hospital, Technical University Dresden. We would like to thank you for your interest in our department. Our website provides you the opportunity for a full insight into our department and to learn more about our treatments and services available. Our patients and their families or partners are the main focus of our team’s concern. We are well aware that you as patient or family member have a strong faith in our surgeons and nurses. The success of a surgical operation significantly depends on the experience and skills of the surgeons and the whole team. Here you are in best hands. A team of highly skilled surgeons and nurses take care of each patient before, during and after the operation. We work side-by-side with the interdisciplinary services of the University Cancer Center (UCC) , the University Vascular Center (UGC) and the University Pain Center (USC) as well as with experts in other disciplines at the University Hospital. We provide close interdisciplinary team work with our colleagues across many University specialties. Patients benefit from a close interdisciplinary management and you are always given the chance to contact us or to work out your personalized care plan. 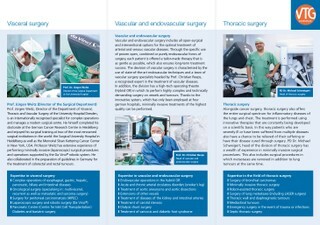 More informations about our surgical expertise! The training of our medical students and surgical residents is of great importance . Only a consequent education of medical students and surgical residents undertaking special programs guarantees a long-standing high quality of the medical patient care. In addition, we offer up-to-date keynote lectures and conferences for interested colleagues, gastroenterologists or family physicians. We all benefit from medical research . Research projects conducted in our department aim to serve medical progress and to improve the long-term outcome of our patients. Please do not hesitate to contact us directly if you have any questions or remarks. We are happy to help you.